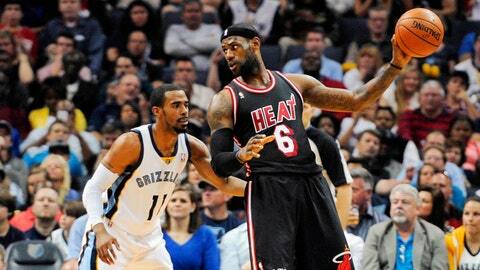 Memphis Grizzlies guard Mike Conley (11) guards Miami Heat forward LeBron James (6). No controversial ending this time, but the Miami Heat’s loss on Wednesday evening might have hurt more than the one a night earlier. The Heat dropped a 107-102 decision at Memphis on Wednesday to drop a half-game behind Indiana in the race for the Eastern Conference top seed. The Pacers (54-25), who beat Milwaukee 104-102, will visit Miami for a Friday-night showdown. Indiana won two of the first three meetings this season. Miami (53-25) lost a night after suffering a one-point defeat to Brooklyn in a game that ended with a controversial non-call when Mason Plumlee blocked Lebron James’ dunk attempt with two seconds left. James had 37 points, six rebounds and five assists for the Heat, who were without guard Dwyane Wade (hamstring), center Greg Oden (back), center Chris Andersen and forward Udonis Haslem (stomach virus). Reserve forward Rashard Lewis scored 17 points, including 4 of 6 from 3-point territory, in 24 minutes. Wade and Oden missed their eighth straight game. Haslem sat out his second in a row. Andersen did not play for the second time in three games. The game was tied at 80 heading into the fourth quarter. Miami then committed five turnovers in the final period. The Heat hit 15 of 25 from behind the arc overall, and the Grizzlies 7 of 20. 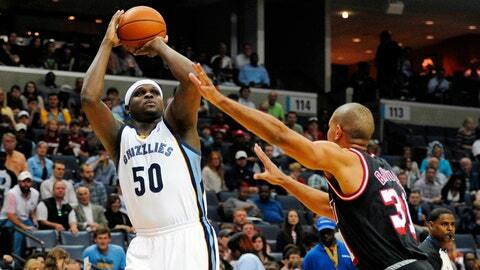 But Memphis outrebounded Miami 41-27 and scored 29 points off 15 Heat turnovers. James had five of the turnovers. After Rashard Lewis’ four-point play knotted the score at 91 with 5:43 remaining in the fourth, Memphis went on a 16-4 run to build a 107-95 cushion with 1:27 to go. Grizzlies point guard Mike Conley scored 10 of his 26 points in the fourth quarter. Memphis outscored Miami 60-30 in the paint. The Heat will play the Indiana Pacers at AmericanAirlines Arena at 7 p.m. Friday.